Evidence that a massive meteorite shower had an impact on Earth on a global scale 470 million years ago have been found on a Highlands beach. Researchers from the University of Aberdeen uncovered tiny remnants of meteorites, smaller than a grain of sand, within rocks in Sutherland. The find is linked to others made in China, the US and Australia. The scientists think the meteorites - a result of a collision in space - triggered earthquakes and tsunami. The university said the find near Durness confirmed previous scientific speculation that the meteorite shower - which followed a "catastrophic event" in an asteroid belt between Mars and Jupiter - was so vast in size that it affected locations across the globe. The study, led by Professor John Parnell from the School of Geosciences at the University of Aberdeen and published in Nature Geoscience, found the Sutherland meteorites were linked to those found elsewhere in the world. Durness is known as a remote location on the Sutherland coast and for Smoo Cave, an impressive sea cave. The late Beatle John Lennon spent summer holidays in Durness between the ages of nine and 14. The Beatles' 1968 song, Across the Universe, was beamed into space by Nasa in February 2008. 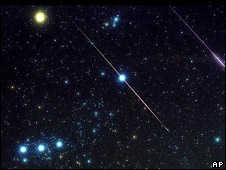 Prof Parnell said these findings would help scientists to investigate further if there was any connection between the meteorites falling and changes to underwater species which took place around the same period of time. He said: "We tested the piece of rock in Durness by dissolving the limestone in acid which allowed us to detect meteorites, smaller than can be seen by the naked eye. "This confirmed that 470 million years ago these enormous meteorites fell in a wide span of locations across the globe - including Scotland. "This is the first time we have been able to prove the mammoth scale of the event and just how many geographical locations felt its impact." The scientist added: "Our research has also pinpointed that the meteorites falling caused earthquakes and tidal waves to take place at the edge of many continents. "Records show that the underwater life which existed on earth at this time became a lot more diverse directly after this major event. Any connection between these occurrences is not clear, but our findings will help us to investigate and potentially pinpoint how it happened."